May 10th, 2012 (5:47 PM). 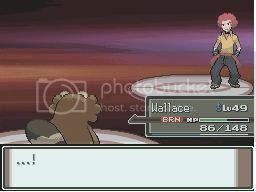 -Got the TM for Rock Slide from Mt. 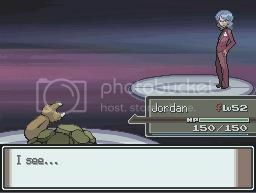 Coronet, Taught it to Jordan. 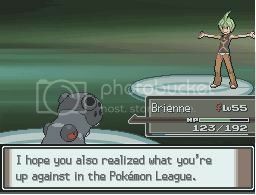 -Beat up Team Galactic at the place, released the legendaries. -I. Hate. Going. Through. Caves. -Killed Girantina because why not. 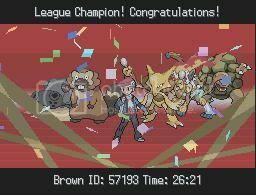 -Got through Victory Road with little to no issue. Found the TM for Stone Edge somewhere along the road (/rimshot), taught it to Umber. -Decided it would be more beneficial for me to have Light Screen on Kazza rather than Reflect. Flew to Veilstone to buy the TM and teach it to him. -After 4 “warm-up” runs we finally did it! 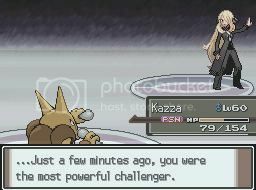 It wasn’t the most graceful of victories, as in a lot of items were used on Cynthia, but as much fun as this whole run was I wanted to get it done with. 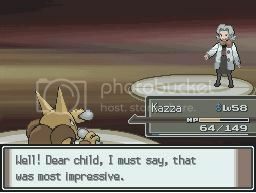 - I didn’t pay attention to who won each battle for me, but Kazza was definitely the MVP (as you can probably see from his level compared to everyone else). 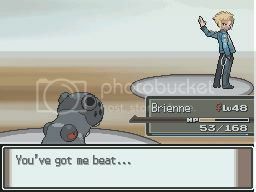 Brienne was a close second, taking physical hits for days, and an honorable mention goes out to Jordan for being the designated revenge killer with Sucker Punch. I had a ton of fun doing this, most of all keeping track of it on here. Pretty sure I'm gonna turn this into an Ultimate, continuing on to FR/LG here soon.